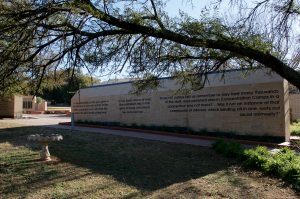 The Garden of Remembrance at the National Women’s Memorial and Anglo-Boer War Museum in Bloemfontein was inaugurated at the end of November 2015. It is located in the the Free State (former independent Boer, now Afrikaner, republic of the Orange Free State). 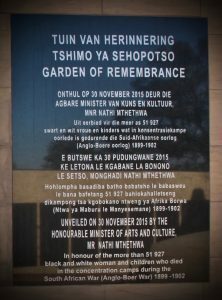 The Garden is dedicated to “the more than 51 927 black and white woman [sic] and children who died in the concentration camps during the South African War (Anglo-Boer War) 1899-1902.” The names of about 35,000 of the over 50,000 who died in the camps were collected and the list of names that forms the focus of the Garden. The concentration camps were created by the British in their effort to defeat the Boers and incorporate the different regions and their populations into the South African Republic. Significantly, this included the Witswatersrand gold fields located near Johannesburg in the then Boer Republic of the Transvaal. Given the Boers’ decision to engage to guerrilla-style warfare, and their reliance on Boer farmers scattered across the countryside for information, food, and other supplies, the British rounded up white women, children, and the elderly and all blacks in rural areas and re-located them to what turned out to be deadly concentration camps. The Women’s Memorial, inaugurated in 1913, and now the Garden of Remembrance, commemorate those who died, more often than not of disease. The garden, a project of the South African Department of Arts and Culture, was directed towards “nation building, social cohesion and nation [sic] healing.” It seems that the first of these, at least, would be achieved through the re-writing of the narrative of the concentration camps to include the “approximately 24 000” black South Africans who died in the camps. Indeed, blacks would not only be included, but would be given an equal place in both the Garden and in history, for there is little in the text of the dedication or in the text about “Symbolism, sources and acknowledgements” that subordinates one group to another. Nation building would also be achieved through the use of three languages (Afrikaans, Sesotho, and English), the declaration that the dead died for their freedom and beliefs, and the reminder that all South Africans have a history of “shared suffering.” It was unclear from the text how national healing would be achieved, other than from the simple construction of the Garden and its inclusion of black victims. The text, with its focus on nation building, cohesion, and healing, however, does not resonate with the Garden of Remembrance itself. The most obvious failure of the Garden of Remembrance, especially in terms of healing, is in its list of names. According to Museum officials, the names of 4,000 black victims are included in the long list of names. They are scattered among the Badenhorsts, Steyns, and Oosthuizens. And they get lost. 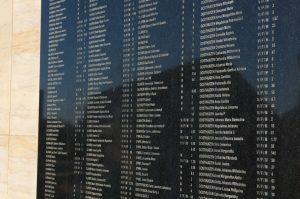 Though separating the names by race would certainly have worked against the purpose of the monument, perhaps an opportunity was lost to condemn the racism of the past by explaining why the names of so few black victims are listed. There is an acknowledgement that not all victims were named. In addition to the fact that Lord Kitchener, who led British military efforts in the South Africa, rather poetically scattered his personal documents in the Red Sea on his way to his next appointment in India, a good portion of the Anglo-Boer War archives were destroyed in the Blitz in 1940. Thus, researchers relied on South African archives. It was, perhaps, just back luck, an accident of history that white names were preserved and black names not. Yet in The Black Concentration Camps of the Anglo-Boer War, 1899-1902, historian Stowell Kessler makes it abundantly clear that the British simply did not record black deaths in the individualized way in which white deaths were recorded. Significantly, the book was published in 2012 by the same War Museum in Bloemfontein where the Garden is located. Rather than lamenting the loss of archives, it would have been an ideal opportunity to condemn the racism of British record-keeping and so work toward nation building, cohesion, and healing based on a more comprehensive understanding of history. Perhaps those who wrote the explanatory text felt that focusing on the British failure to record the names of black victims would have worked against the goals of unity and cohesion. Certainly the idea that blacks and whites had a different experience in the camps, even if only in death, would have challenged the idea of shared experiences and shared suffering the text promotes. Yet, though blacks and whites were both interned and did both suffer, there were few other similarities between their experiences. First of all, blacks did not die in the camps because of their love of freedom or because of their beliefs, as the text in the Garden of Remembrance suggests. Certainly Boers did, but blacks were interned in the camps to prevent them from helping the Boer guerrilla, either voluntarily or involuntarily. Blacks, Kessler writes, were seen as a liability and were interned as a result. Kessler documents that conditions in black camps were worse in every possible way, including sanitation, housing, health care, and food. Colonial policy dictated that “natives” be self-sufficient, leading both to minimal spending and indeed neglect in black camps, as well as the insistence that black internees work to contribute to the war effort and grow their own food. Conditions in the white camps improved after visitors like Emily Hobhouse denounced the desperate conditions Boer women and children had to endure, but no such improvement took place in the black camps. This was at least in part because, despite Hobhouse’s suggestion that they do, no one made an effort to visit the black camps even though many were located just a short distance from white camps. The Garden of Misremembrance seeks and fails to create cohesion and unity in the present by re-writing the past and re-imagining it as one of shared experiences and shared suffering where these did not, and do not, exist. *An earlier version of this post did not recognize that the names of 4,000 black victims were also included in the list of those who died in the concentration camps.